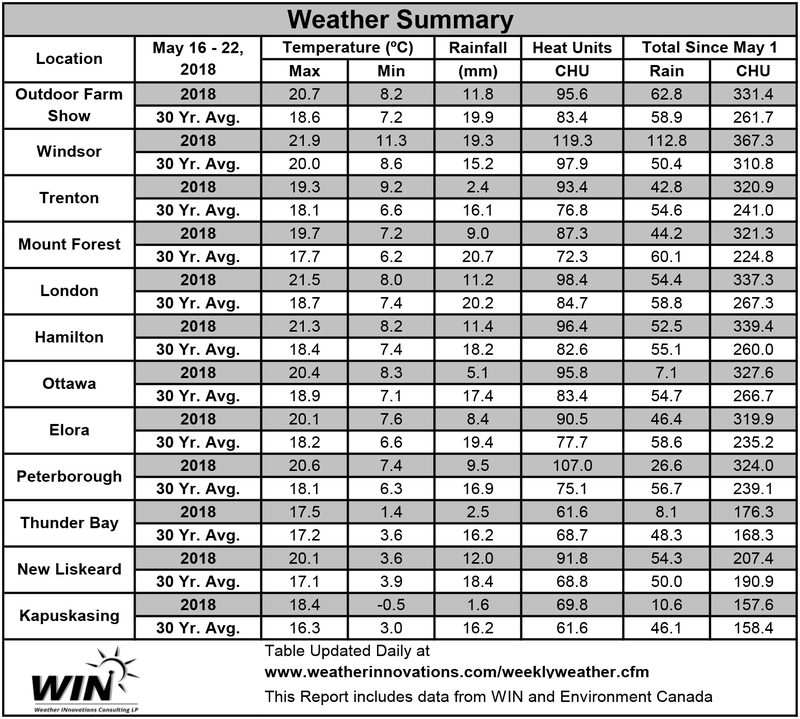 Planting conditions have been good in many parts of the province; however, there are some areas that have been too wet, resulting in delayed planting. Areas affected include the heavy clay soils in Essex, Chatham-Kent, Lambton, Elgin, Haldimand and Niagara. Corn, soybean and canola planting have also been delayed in many parts of northern Ontario due to late spring and poor drying conditions. As conditions improve in these areas, growers who are anxious to get back into the field need to remember to be safe on the farm and the roads. Overall, crop emergence has been good. However, some of the early planted heavier soils have had poor emergence from poor seed to soil contact and poor seed slot closure in damp fine texture soils. The most advanced winter wheat is at the early boot stage, with a few awns becoming visible (Zadoks scale 49) in southwestern Ontario. Most of the winter wheat crop is in the early to full flag leaf stage (Zadoks scale 37 to 39) with most of the acreage in good condition. There is still the odd thin stand that may be replanted to another crop. Nitrogen has been applied to most of the wheat with the exception in areas which have been too wet to get into the fields (heavy soils). It is now too late for in-crop weed control as herbicides now could negatively affect yield. Fields that received a fall herbicide have significantly better weed control this year. With the exception of some specific areas, the disease pressure has been low so far in most stands. There have only been a few reports of powdery mildew and septoria pressure. Most of the early fungicide applications have been applied. 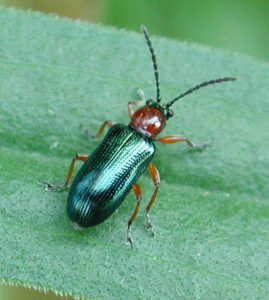 Fields should be scouted for cereal leaf beetle (CLB), as infestations are more widespread this year and have the potential to reach threshold in several fields. The threshold for control is one CLB adult (Figure 1) or larvae per stem after boot but prior to heading. If significant feeding is taking place on the flag leaf in the early heading stages, control is warranted. Most of the intended spring cereal acres have been planted. The early planted spring cereals have emerged and most stands look good. Some stands on heavier soils that were worked on the damp side are thin. Pastures have had slow growth so far this spring, particularly noticeable where pastures were heavily grazed last fall. In some situations the livestock have had to be turned out too early due to low on-farm forage inventories. Hay stand growth has improved significantly in the past week. In southwestern Ontario, 1st cut will begin near the end of the week. These fields cut early should be scouted for possible alfalfa weevil larvae feeding on the regrowth. 80 to 90% of the intended corn acres have been planted in areas where the soil conditions have allowed. Less than 1% of the intended corn acres have been planted on the heavy clay soils in the Essex, Lambton and Haldimand to Niagara areas. These fields will require a week or more of dry weather for planting to start. This area makes up approximately 15% of the intended corn acres. The date for switching hybrid maturities was May 25th at London and May 30th at Ridgetown. About 25% of the intended provincial soybean acreage has been planted to date, with very few acres planted on the heavier clay soils. 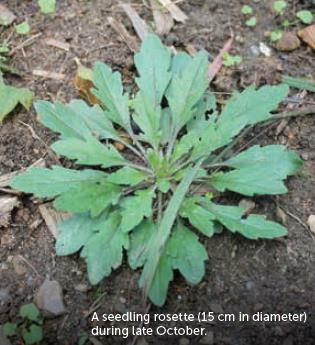 More growers are planning for weed control programs to control Canada fleabane (see Figures 2 and 3 for examples of different growth stages of Canada fleabane). Most intended acres have been planted in southern Ontario, but planting has been delayed in northern Ontario due to poor soil drying conditions. The early planted spring canola has emerged and is looking great. The winter canola is in full bloom. Few acres are planted to date. Planting the 1st week of June is considered the normal planting date to avoid the risk of frost damage.